Today we decided to head west. 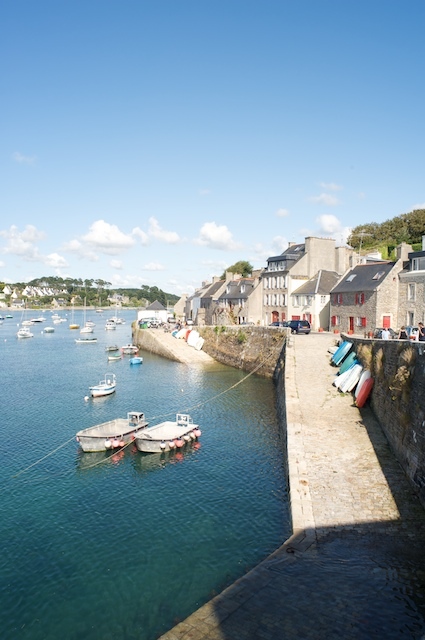 Brittany is a peninsula, and the western part, we hoped, would be full of little fishing villages and rocky coastlines. First, after leaving Vannes, we headed to a very small town not too far away called Carnac. The town itself is not what we were interested in, however. Carnac is famous for being surrounded by hundreds of stone megaliths: ancient pre-historic stone monuments, sort of like Stonehenge in England. Nobody knows who erected them or why. 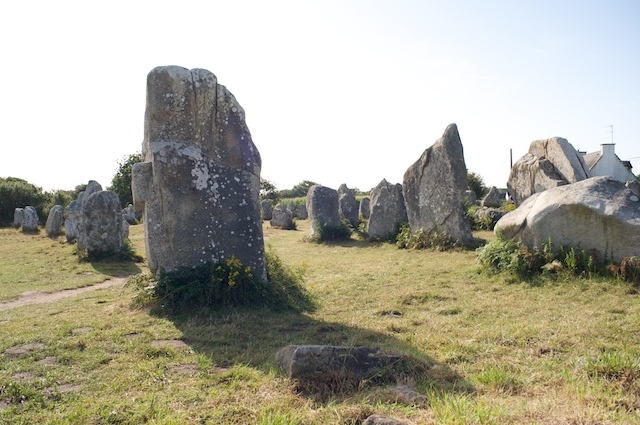 We drove out of Carnac and, in between cornfields, we came upon a grassy field, with a tiny parking area nearby, filled with dozens of stone megaliths standing in it. They ranged from a couple of feet tall to maybe 7 or 8 feet. Some were in rough rows. Most were placed randomly. They were roughly hewn or carved out. These very, very old human artifacts always send a chill down my spine. People had worked very, very hard to construct this, thousands of years ago, and they were still here. We took way too many pictures of course, and then resumed our journey west. Our next stop, just to have a quick lunch, was the town of Quimper. The part of town we saw was not terribly interesting, just normal stores and offices, etc. We had a very simple lunch, salad and sandwiches, and got back on the highway. The main highway took us all the way to the big town of Brest, which is on the western part of Brittany. We missed a turn for the road that went around Brest, and ended up going through town. Brest is a big, industrial sea-port, which didn't have any tourist appeal, so after getting a little lost once or twice, we headed west again, out along a smaller peninsula southwest of Brest. I had the idea of going out to the tip of the peninsula, which I hoped would a be a pretty sea-coast area, but Donnie was worried that there might not even be a hotel out there. I had cheated a bit, since Donnie was driving, and had a look at one of our guide books, which mentioned at least one hotel in the little town out at the end of the peninsula. I gambled that there would be a room when we got there and that the hotel would be affordable and acceptable. 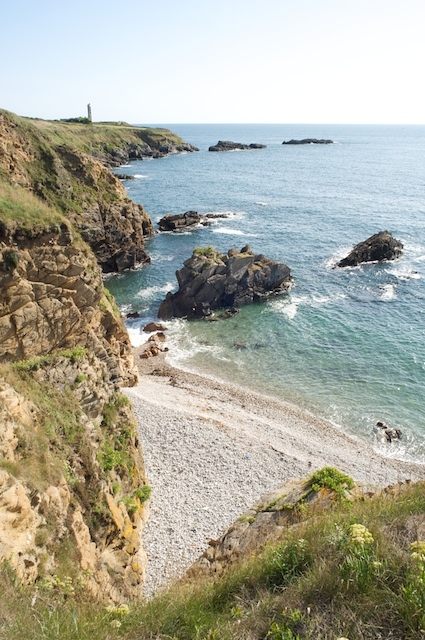 We drove out further and further, passing tinier and tinier villages, going along smaller and smaller roads, until we reached our destination of Pointe St Mathieu. Firstly, it was a lovely, rocky sea-coast. 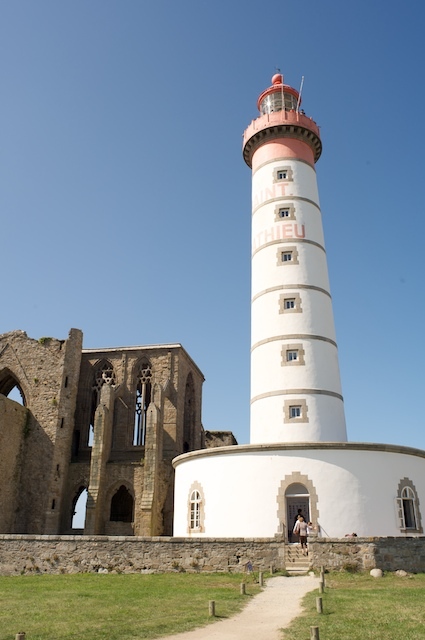 Secondly, I had read in the guide that the hotel was right next to an old abbey and a lighthouse, and there they were! We stopped in front of the hotel, directly opposite the lighthouse and I went in to check if there was a room available. I asked the lady at the desk, in my broken French, and she laughed ( I thought that she was thinking, "silly American trying to get a room at this hotel at the last minute with no reservation"), but she rattled off some French too fast for me, but I did understand that there was one "Grand" (large) room available. Her young assistant, who spoke some English, then offered to show me the room, and took me up in the elevator. The hotel and the room were fantastic. The room was huge, with a sitting area, a table and chairs, two large comfy chairs, an outdoor private deck, lots of big windows, etc. etc. The hotel, even though it was in what appeared to be a small, old, ancient stone building, was modern and well appointed inside. It even had an indoor heated swimming pool! I was thrilled, but I wasn't sure if this might be so expensive that we couldn't afford it. I asked the assistant who was showing me the room what the price was, and she gave me a figure that was very acceptable. Not exactly cheap, but not overly expensive either. I said yes, and went outside to tell Donnie. Previously, while driving out to the end of the peninsula, Donnie told me that if there really was a room at the end, and it was nice, she would never, ever, complain about anything I ever did again! Wow! Too bad I can't expect this to really happen. We took the room, and after spending a few minutes there, decided to stay two nights. The hotel was lovely. The scenery was lovely. The place was very peaceful and tranquil. Just what we needed after a few hectic traveling days. The town of St Mathieu is very, very small. There are a few old stone houses behind the hotel scattered on a low hill. On the road leading through the town is the following: The hotel, with its bar and restaurant (a very, very fancy restaurant that requires reservations and has a Maitre' D in a tuxedo! 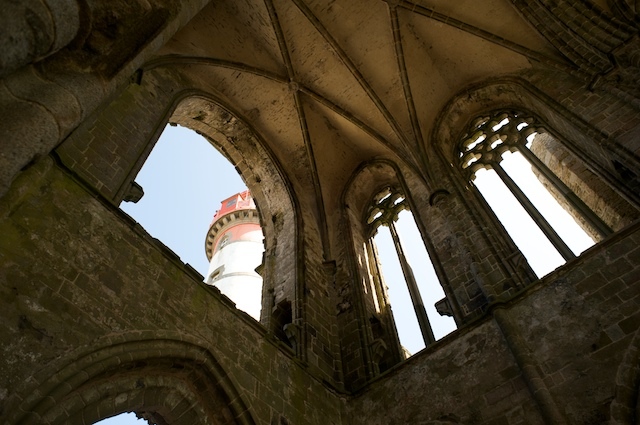 ); the ruins of an old Abbey; a small, old stone church, right next to the Abbey; a big lighthouse, still in operation, literally one or two feet from the ruins of the Abbey; and a coast-guard tower, with all kinds of antennas, again, only a couple of feet from the Abbey. That's the town of St. Mathieu. Oh yes, the Post Office and the town museum. They're inside the bottom of the lighthouse! After relaxing for a little while, we drove along the coast road to the nearby town of Le Conquet. This is a giant town, compared to St. Mathieu. There are maybe a hundred or so houses, half a dozen restaurants, little shops, a church (of course), a rather ugly, modern, mayor's office, and a nice old port. We wandered around town for a while taking pictures. We had checked out the town because we wanted to find places to have dinner. When we checked into the hotel, they asked us if we wanted to reserve a table at the very fancy restaurant in the hotel, and said we had to make up our minds quickly as there was only one table available, and that might go quickly. We looked at the menu, and were a little daunted. The menu was all in French, of course, but most of the items were various kinds of sea-food that we didn't recognize, and the prices were quite high. We declined dinner, partly because of the prices, and partly because we really didn't want to order something that might come to our table with all kinds of eyeballs, and fins, and tentacles and claws sticking out. (Neither of us are big sea-food eaters, and when we do eat sea-food, we are pretty conservative, sticking to fillets of some white fish, like cod, or maybe shrimp or mussels). So when we declined, the desk-clerk said that there would be places to eat in the nearby towns, but we had no idea how late they would be open. Most of the little French villages close down quite early. Many shops and cafes closing as early as 5 or 6 p.m..
We drove back to hotel and just chilled out for a while. We had a Coke and a glass of cider to drink at the outside tables in the bar of our hotel, and then a little before 8:00 we drove back to Le Conquet for dinner. As we had expected, all the shops were closed, but there were one or two restaurants open. We went into one near the port, which billed itself as an Artisanal Creperie, and asked for a table. It was now about 5 minutes after 8:00. The person asked if we had a reservation, and when we said no, he kind of pursed his lips and looked at a piece of paper and said sorry but it was not possible. Donnie, having a brilliant idea, asked if we could we make a reservation, for say 8:30. He started to say no, but then stopped, thought for a second, and said "pourquois pas" (why not). He laughed, took our name, and bid us a "toute a l'heure" (see you later). We walked along the small beautiful port for our 25 minute wait, and arrived back at the restaurant at precisely 8:30. There were a few people waiting to get in, but when the man finally got to us, and Donnie gave our name and said "reservation for 8:30" he looked at the time and laughed again, and showed us a table. We had very good crepes (and Donnie had a big order of ice cream for dessert), with cider, and we drove back to the hotel, stopping along the way to enjoy an absolutely gorgeous sunset, over the Atlantic ocean! (with me cursing myself for not bringing my camera!). Today was our sleep-in and relax day. We got up later than usual, went down for a casual continental breakfast with good coffee and rolls. After breakfast, Donnie decided to relax in the room for a little while, and I went for a short walk along the the rocky coast, which looked a great deal like all other rocky coasts in the world. Later, we decided to take a short, leisurely ride around the peninsula, looking at some of the little towns. The towns were tiny. The roads were tiny. The short leisurely ride took almost the entire afternoon. The scenery was beautiful, a mixture of rolling hills full of small farms and rocky coasts and small port towns with lots of little boats. The weather was almost perfect: temperature in the sixties, white puffy clouds and a nice fresh breeze. We drove for a while, trying to navigate our way around the coast, finding it difficult since the roads were not numbered, and the road signs directed you via the names of towns that you then had to find on the map to see if they were in the direction you wanted to go. Sometimes the town that the sign pointed to was way on the other side of the peninsula, and it took a while to find it on the map. We didn't find a town that had a place for lunch since many of the towns were so small that they didn't have any restaurants or even a sandwich shop, and it was already 3:00. In one little town, we did find a bakery, and it was open (many bakeries close early, after having sold out of their fresh bread in the morning). We hoped to find a sandwich, but they only had pastries. One item they did have, and which we bought, was a couple of small, personal-sized Kouign Amann. 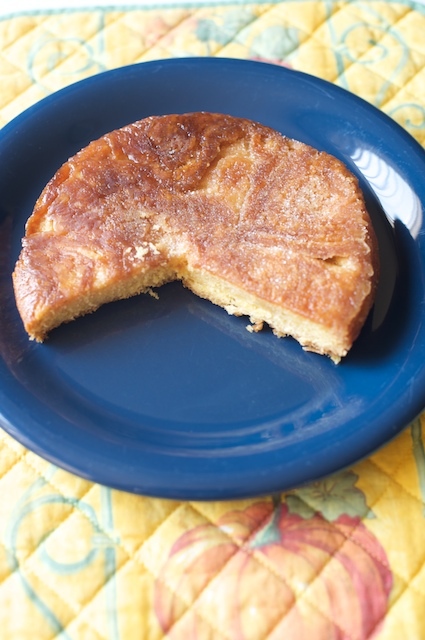 Ah, I'll bet some of you are asking "what the heck is a Kouign Amann?" 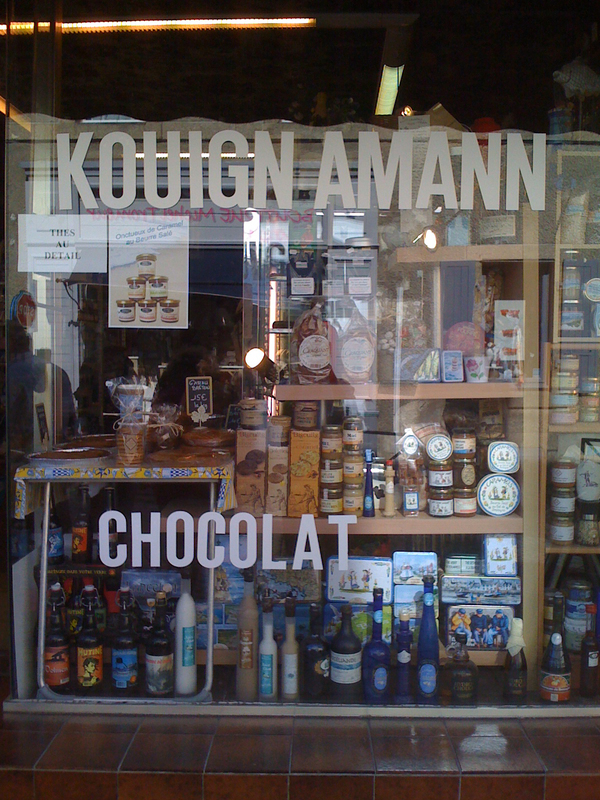 We had read about it in the guidebook, and had seen it in several stores that sold local specialties. It's a Breton cake, which is round, flat, about 1/2 inch thick. The recipe in the guide book said the ingredients are something like, butter, flour, butter, sugar, butter, eggs, butter, butter, and butter. It said that when you bake it, if some of the butter oozes out, use it to baste the Kouign Amman. I guess it has a lot of butter in it. During our travels in Bretagne, or Brittany, or Breizh (which we think is the name of the area in the old Breton language), we saw very few cheese shops. In the rest of France, there are fromageries everywhere, but we hardly saw any here. Our conclusion is that the Bretons don't eat a lot of cheese, but they make up for it by using butter in everything. Even the desert crepe I had for dinner last night, which was filled with apples and bananas, was covered in melted butter. So after buying two Kouign Amman to eat later, and driving some more, we finally found a supermarket, of all things, in one of the larger towns, and stopped in to get a baguette and some cheese and something to drink, and took it to a parking area on the edge of a lovely port and had an impromptu picnic. By now it was getting late, and so we started the tortuous ride back to lovely little Pointe St. Mathieu and our hotel. The ride back was less fun than the ride out because Donnie was getting tired of driving and the roads seemed more convoluted and narrower, and the French drivers a little crazier. We got back to Le Conquet (which in Breton is called Konk-Leon! We still want to know who conked Leon), and stopped in at a bakery for another baguette. This one was amazingly still open and still had baguettes, even at 6 p.m.. Then we went to a charcuterie a little way down the street for some cheese, pate and salad, so we could eat a quiet dinner later without having to go out searching for an open restaurant. We got back to the hotel, and rested for a while, and then Donnie decided it was time to taste the Kouign Amman. We finally found out, by asking the lady who sold it to us, is pronounced "queen-amman". Donnie said is was ok; it would be good with coffee. I thought it was great! We'll have our home-cooked dinner in our room soon, and then relax for a while, and then retire for the evening. We're hoping for another glorious sun-set over the Atlantic.